Does Vita’s ‘Toukiden: The Age of Demons’ Beat Monster Hunter at its Own Game? Monster Hunter, as we know, is a uniquely Japanese phenomenon. The franchise gained some modest acclaim in the West with Monster Hunter Tri, but before that it was certainly obscure around these parts. In Japan, though, it is the biggest of big deals. It couldn’t get any bigger or… dealier. Those guys can’t start their day without jabbing a large dragon or two in the eyeball with a lance. That’s just how it is. These Hunterholics never did embrace the Vita. A lot of this can be attributed the fact that Capcom’s action RPG has never made it to the console. But there have been similar releases. The wonderfully creepy Soul Sacrifice brought us hunting with a hideous that-thing’s-got-a-mouth-where-its-stomach-should-be feel, and a nightmarish aesthetic. 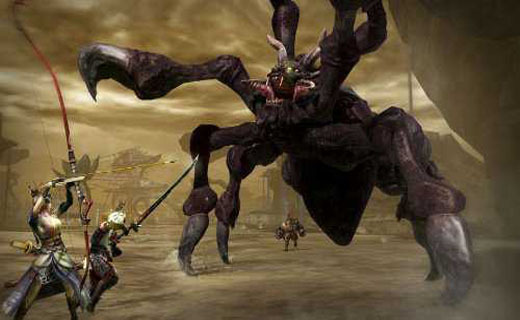 Already a success with a sequel confirmed, the genre is gathering momentum on the handheld. Next up is the spangly new Toukiden: The Age of Demons from Tecmo Koemi. The setup will be instantly familiar to anyone who has ventured into Monster Hunter before: you are a novice hunter, moving into a small village plagued by… demonic nasties. Your goal is to work your way up through the ranks, from simple quests against small fry to dispatching huge slavering death-beasts. Of death. Scavenging items from defeated foes will allow you to forge new weapons and armor sets, thus ‘upgrading’ your character until they are a match for bigger, toothier, angrier beasts. In between quests, you are returned to the village ‘hub,’ where you can listen to the prattle of the NPCs, visit the shops, all the usual RPG trappings. There is a small assortment of different weapons to master, longsword, bow, spear and such, each of which perform a little differently and cater to different combat styles. It’s all very Monster Hunter, in short, but much more than a simple clone. 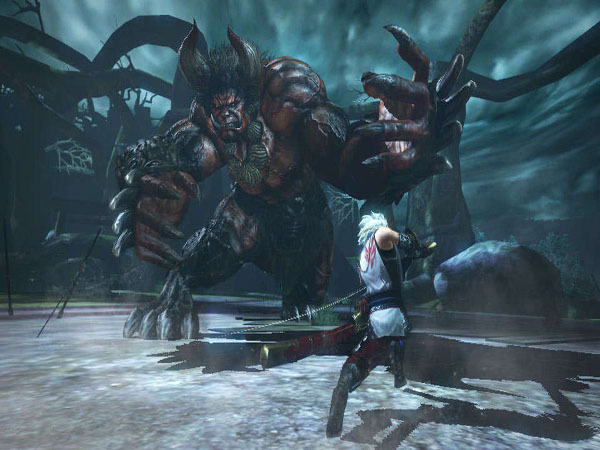 In Toukiden, as in Soul Sacrifice, there is a substantial narrative to follow. 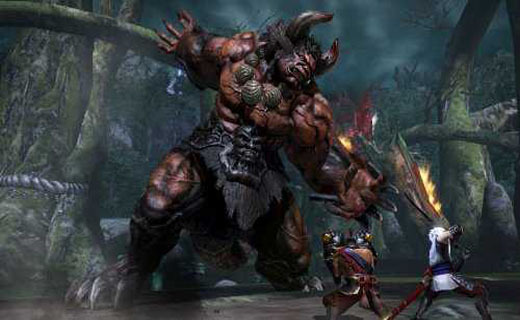 The story focuses upon the Slayers (hunters) and their war against their enemies, the demonic Oni. Said beasts’ assaults have become more coordinated, and the warriors of the village suspect there is a new ‘leader’ of sorts in their ranks. While it’s hardly The Da Vinci Code levels of intricate plotting, it’s a welcome addition to the game that is lacking elsewhere. In the missions themselves, Toukiden is again different. You can’t bring a limited satchel of items, or set traps or bombs for your opponents. You rely solely on your weapon and your equipped Mitami. This is the soul of a departed warrior, which you can affix to your chosen stabbing stick at the blacksmith. It will grant you different abilities in battle, and there is a huge selection of them in each of the eight disciplines. These determine the powers you can use. The Attack style bolsters your power, for instance, while the Healing style allows you to remove status conditions and revive teammates on the fly. With the more combo-heavy combat style, quests in Toukiden feel rather more streamlined than Monster Hunter. As does the game as a whole. Without much of the between-mission micromanagement, this new Vita effort has rather more of an arcade-y feel to it. It is all around more accessible, I’d say, and brings a Feudal Japanese charm to the genre in its aesthetic and some of the weapons choices. Inspired enough to appeal to fans, certainly, but with some unique touches all its own. Whether these are for the better or worse will be down to the player’s feelings.